Sunday August 7 1910 I felt very tired but did the work in the AM and in the afternoon wrote letter to McCalls. Lydia Lorna & sister Ida. In the evening I went down to Coralville to church. Weather warm & dusty. Monday August 8 1910 I sewed some on my dress in the forenoon, late in the afternoon and evening while Will was gone to a council meeting. I helped him put the last of the wire on the fence in the afternoon. Got [illegible] cards of Scott or Lizzie Tuesday August 9 1910 I sewed all day and evening on my dress when not busy with the house-work and got it nearly done. 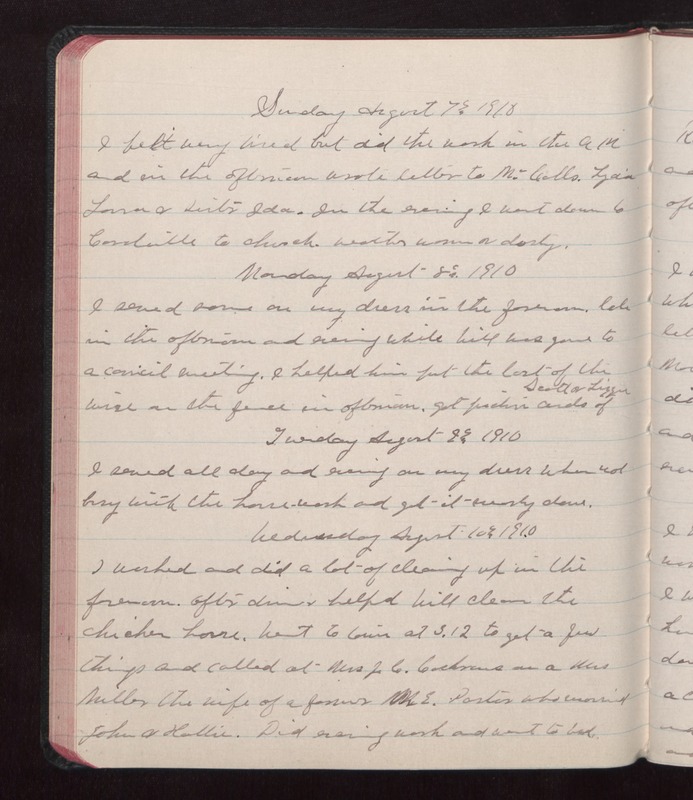 Wednesday August 10 1910 I worked and did a lot of cleaning up in the forenoon. After dinner helped Will clean the chick house. Went to town at 3.12 to get a few things and called at Mrs. J. C. Cochrans on a Mrs Miller the wife of a [illegible] Mr E. Pastor who married John & Hattie. Did evening work and went to bed.